For the second time in three seasons, a top three seeded Seward County Lady Saints team is headed home after the first round of the Region VI Tournament after they were swept by Butler in swift fashion Sunday night in Hutchinson. Things didn’t start well for the Lady Saints who watched as Butler went right at Seward from the first whistle, taking a 10-6 lead to begin the first set before quickly stretching that lead to 13-6 at the midway point of the set. Seward never got any closer as the Grizzlies went up double digits at 20-10 before finishing the Lady Saints off 25-14. It was another slow start for the gals in green in the second as Butler broke out to a 4-1 lead and took a 12-9 lead to middle of the set. After the Grizzlies stretched their lead to six, the Lady Saints battled back, cutting the Butler advantage to just two at 20-18 late in the set. After two points from Butler made it 22-18, four straight Seward points tied the set at 22. 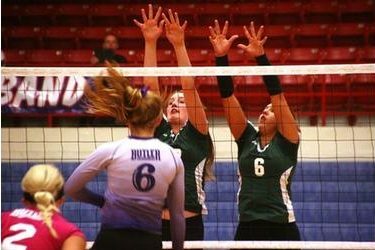 After Butler took control back, the Lady Saints fought off two set points, but the Grizzlies capitalized on their third chance, getting a block in the middle to finish Seward off 26-24 and go on top 2-0 in the match. The third set started just as the first two, with all the momentum on the Grizzly side of the net. Butler jumped out to an 8-4 and then 13-7 lead as the Lady Saints struggled to get anything going. Seward finally found some life, cutting the Butler lead to 17-16, but once again the Grizzlies prevailed in the end, outgunning Seward down the stretch to win 25-23 and sweep the match 3-0. The tough night for the Lady Saints was telling on the final stat sheet as Seward scored just 48 points while giving up 41 due to errors in the three setter. Seward hit just .132 as a team in the loss, finishing with 20 hitting errors in the match. The lone bright spot for Seward was Carolina Gasprini who finished with 13 kills and 13 digs in her Lady Saint finale. The sophomore finished her Seward career with six straight double-doubles. Seward ends a disappointing season 23-19 overall and now has just one postseason win in the past three seasons. Butler improves to just 14-19 on the season with the win and will face Colby in the semifinals on Monday.